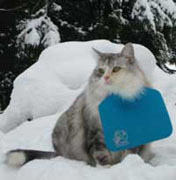 The cat bib didn’t stop Bailey from stalking birds, even in the snow. He just doesn’t have any luck in the catching department. He doesn’t mind wearing it at all and patiently waits while we put it on him. Its such a relief to know he’s not out torturing birds. Its nice too that people know he’s not a stray. We also change the color of the bib each outing so neighbors don’t think we just let him out and forget about him. They also appreciate the fact that we use the bib and don’t mind him hanging out in their shrubs. Great invention! When we brought home our cat, Obsidian, he was a little black ball of kitten fluff. We had no idea that he would grow into a highly successful predator, bringing in birds every night. Since we began using Cat Bib, he has ceased killing birds! Along with all the beautiful mountain meadowlarks in our area, we thank you for creating Cat Bib! We struggled for a long time because we have three kids and all of their friends going in and out of the house making it extremely difficult to keep my cat, Summer, inside. We considered declawing but after looking into it, we weren’t convinced it would make a difference in deterring her from successful hunting. We tried cat bells on her collar to no avail. We were absolutely thrilled when we discovered the Cat Bib. It is an excellent way of ensuring the safety of the birds in our neighborhood. 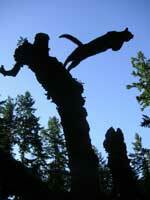 Summer is a skinny and tall cat that is an avid hunter and loved to catch and eat her prey. Even with her small size the large Cat Bib was lightweight and effective! Thank you so much for inventing a humane way of keeping the birds safer from my cat and allowing my cat some freedom to explore. Thank you SO much for inventing the Cat-bib. Our rescue cat ‘Holly’ has now stopped catching birds. The week before this arrived she had caught and eaten two birds and a mouse. My poor husband who is a bird lover had to clean-up the mess as I’m too squeamish. Holly had a cat bell so we could only presume the birds she caught were deaf! It took her about 48 hours to get used to wearing it and a small amount of sulking (as described in your helpful information leaflet) but now she’s doing everything she did before, except the birds are getting away! I watched her one afternoon suddenly jump towards a sparrow , which she didn’t catch because the bib flipped-up and the bird must have seen the bright turquoise colour and made a dash for it. Safe and all in one peice. As you can see from the photo, she’s enjoying the hot weather and not fussed.Thank you for saving our birds, we were getting despondent and now we can stop fretting about what she’d kill next. Several months ago I was at my wits end with my cat bringing home 2, 3 or even 4 birds a day! Sometimes dead and sometimes still alive, but badly injured. Cat Bells did not work – she had 3 of them on her collar and still brought home just as many birds! I didn’t know what else to do, but I thought maybe there was some product or something that could help, so I went on line and did some searching and up popped the Catbib! I read the testimonials and all the other info and ordered one immediately. Cleo was used to a collar and so she accepted the bib very easily and it didn’t hinder her in any way. It helped quite a bit, but she was still bringing home several birds a week, so I decided to order the Big Bib. I was a little concerned that it wouldn’t be suitable for such a small cat, but she was fine when I put it on. It is just wider, not any longer. Well since that day which was about 4 months or so ago, she has only managed to get 2 birds! She hasn’t brought one home in at least 2 months! I am so pleased with the outcome with the CatBib!! I try to tell as many cat owners that I know about it and am even trying to get my local newspaper to do an article about the CatBib. Thanks so much for your wonderful life saving product! I am just writing you to thank you for inventing this product! As a bird loving cat owner with a stray feral kitty who can’t stand to be indoors, I was letting my cat outside during the day only to be seriously distressed about finding dead birds on my porch every day. She was killing at least three a day. While I understood it was just her natural instinct to do this, and would never punish her for it, I was NOT HAPPY. I love all animals and this was very painful to me to witness. I tried cat bells on the collar but that did not work, as she was too stealthy. Since buying your product, and to be honest I was very skeptical at first because I just couldn’t see how something as simple as this could save birds, but the low price and free shipping made me want to take the chance (plus the possibility that it could in fact save birds) I bought one. I cannot begin to tell you how happy I am with this product. Not only did my cat become accustomed to it rather quickly, because it is so lightweight, but it is also very easy to clean the material by hand with a cloth. My cat also loves it because she quickly realized that when I put the bib on her breakaway collar (which makes it safe too) that this means she can go outside. She doesn’t even notice it’s on and still does everything she loves to do outdoors which makes her happy except NO DEAD BIRDS. It’s unbelievable even to me, but after three weeks of wearing it outside every day, NO DEAD BIRDS, and before the bib I was finding at least three a day on my porch. Thank you so much for this product! I will tell everyone I know about it, and have already submitted online articles about it to various cat websites where people were having the same problems. Plus, it’s a great conversation piece. I can’t tell you how many people ask me about this brightly colored thing hanging from my cat’s collar, and thus it gives me a chance to educate them about this product. Thank you, thank you, thank you!!! Here is my cat Zeke. I want to thank you so much for creating this product! Zeke was quite a skilled hunter and would catch a bird every single day. Now, with his bib he rarely ever catches anything. It is nice to look out the window and not find a nasty surprise. I will highly recommend this product to any cat owners with bird killing problems. Thank you again. We have used the CatBib for almost two years. Our sweet but determined cat had killed about a bird a day until I found the CatBib on the internet (looking for a cat bell) Although the cat almost never catches a bird now she can do everything else she likes. Here is a picture of her in the top of an old cherry tree wearing her Bib, then springing off the top of the tree onto the next limb! What an athlete! The Bib is in silhouette, but she is wearing it! I always purchase several Bibs at once, for when they get pulled off in the woods, and for giving to friends with cats. I have taken them to the vet’s office, the feed store, the pet shelter, encouraging everyone to tell everyone about the Bib! I just wanted to praise your product! We have two young, efficient hunters and, since putting them in cat bibs, we have gone from 1 to 2 birds a day to – none! Thank you, for ourselves, our cats, and the goldfinch population they can no longer depredate. And thanks for your great work. It’s such a pleasure to let them enjoy the outdoors without worrying about the native species. Had they ever caught a house sparrow I might have different feelings but, alas, there’s a reason invasive species thrive. 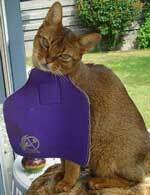 Just wanted to thank you for inventing the CatBib. Musette was bringing in almost a bird a day. I remembered seeing a cat at the end of our alley that had a biblike thing on. I searched for “cat bib” and your site came right up. Musette has only killed three birds in the year she’s been wearing the bib. It took a day or two for her to get used to it but I encourage people to STICK WITH IT! 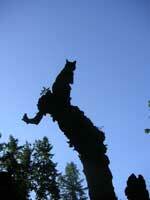 Now she waits at the door while I fasten it on, and she climbs trees with no problem. As a side benefit, burdock burrs often stick to the bib instead of her fur. I was just so amazed. My cat, named Kitty, adjusted to it within just a few minutes. At first, he walked around the house as if he was measuring every foot print he took, but then, he just started adapting to the CatBib and started walking natural again. I took him outside and he just loved it. He was free to walk where ever he wanted in the back yard without me yelling at him to stay away from the birds or the feeders. He was so relaxed in the CatBib, it didn’t bother him a bit. My Cardinals and Finches were still eating in the feeders while he laid down and watched them. The greatest part about the CatBib is, the squirrels didn’t come down and eat at the feeders!!! We have 5 squirrels that eat every almost all the seed before my Cardinals could fly down to the feeders. The squirrels could see the cat from the branches in the trees where they were sitting, and I could hear their chattering back and forth, as if they were complaining that the cat was there. Never once did the Squirrels come down. Yipppeeee!!!! Finally, my birds will be able to have seed in the feeders again. Those pesky squirrels will stay away now! Thank you so much. I will definetly spread the word around to my family and friends about the CatBib. Your product is great! Here is a picture of our cat Pinhead wearing his CatBib. We love this product! He used to bring us animals almost every day. Now that he has his bib he is very rarely able to kill any animals. Thanks for creating such a great product! 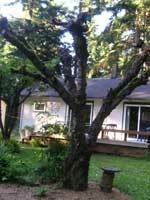 Dear Catgoods and the wonderful cat lover in Springfield, Oregon who created the Catbib, The summer of 2007, my father and I built a custom deck, it was my first experience in carpentry…and I loved it. In fact I built a wonderful LARGE bird feeder. It has a roof and a removable try and is over 4ft, but I underestimated my kitty and was devastated to get those kitty gifts at the door. I searched and searched for help…but everything cost soooo much money and required a lot of effort. I decided to go back online and search again…and found the Catbib!! I am a skeptical kind of person, but for only $10.00 I thought I’d try it out. The first big test is whether or not my kitty would tolerate it. But to my surprise, she did – no problem at all. And of course the next question was how effective it would be. Well, it has been about 8 months and I would say that it is at the very least 95% effective. We did have 1-2 kitty gifts at the door, but I’m not too sure if she caught it or found it. I must also mention how easy it is to clean. Of course dragging it around all day, it does get pretty dirty, but soaking it in some detergent for just a bit and wringing it out, and viola it is nice & clean. I live in CT in a small area called ‘Pine Rock Park’ and there is very little traffic, there is no outlet beyond our house. Therefore I feel safe letting my cats out and believe that cats should enjoy the outside just as much as other animals and everyone else. 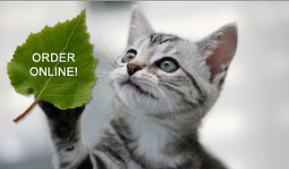 Of course, this holds true for safer environments, as well as the cat’s personality. Well thank you again for creating such an easy and affordable way for me to keep both my cat and my birdies! I hope you can enjoy the attached picture of Hillary, our only hunter. I took it with my cell phone, so the quality isn’t great. Her bib has been such a blessing for the birds in our foothill home. She used to bring home birds pretty regularly, but after she started wearing her bib, daily unless it was raining or snowing, not one!! We recently relocated to Oregon, and kept all 3 cats inside for a week to “aclimate” to their new house. The first day they were released, my husband forgot to “dress” Hillary. She was back with a bird in 15 minutes. Fortunately, when I picked her up, she released the bird, who was uninjured. No mistakes since then, and no more birds caught. She is totally comfortable wearing her bib, runs, jumps, climbs trees, even sleeps with it (and licks it…for what, I don’t know). Thanks for this bird-saver! This is my cat Marvin. He is a great bird catcher, that is until he got his bib. I have had the bibs for about 2 years, and neither one of my cats can catch birds anymore. I love this product. I recommend it to anyone who has a problem with their cats catching birds. This is our former frequent mouse-killer Chester wearing the bib that has made such a difference to our lives and, more importantly, to the lives of the wildlife in our garden! We’ve not had a single dead mouse or bird brought inside since we discovered Catbib over 18 months ago. I’m not too sure how it works but you can’t argue with results like that. A great idea! I have 5 rescued cats, but only sweet shy Megawati was a problem with birds. She is miserable if I keep her inside all of the time, but as I feed a lot of birds at my rural home, all she wanted to do was to lie in wait for a chance to attack them. I was tired of constantly shooing her away, using a squirt gun, it didn’t matter; she’d be right back there. And she was getting worse, killing a bird almost every day. I searched so hard for a solution, then found your website and decided to try a Catbib. Wow, what a fantastic simple effective product! I spent a couple of days getting Megas used to a collar first, the we tried the bib. The first day I had it attached too long, and she managed to get both bib and collar off. The next day, I just attached it shorter so she didn’t trip, and she wore it well all day. That was 6 weeks ago, and now she know the routine. She can go outside only after I put her Catbib on her. I do wait a few hours after feeding the birds in the morning though before letting her out. She can still go outside and watch the birds all day, but I don’t think she’s caught a single bird since. Some stray dogs came in the yard last week, and Megas was up a tree in a flash with her bib, and she can run well too. Being both a cat and bird lover, I am so relieved to have found the solution. I only wish that your bibs were more well known and widely available so that more people know about them. They should be in every pet and feed store, I think. I’ll do my best to spread the word. Thanks so much for helping save the wildlife. Otto Orange in his bib. Now that he wears the bib outside, he stays much closer to the house. He doesn’t roam in the woods at all anymore. Otto still tries, but is unable to catch birds with his bib on. Saving as many birds and small mammals is very important to me. As much as I want to keep my cats in all of the time they drive me crazy crying to go out. I enjoy feeding the birds around my property, however, my cat, Menew, would make quick meals of them! I tried many other strategies to keep the birds safe but all of these were ineffective. In desperation, I looked for more ideas on the internet and found what would become the solution to my problem: the Cat Bib. Now, I can allow my cat to play outside without the worry of another feathered victim. Thank you for creating the Cat Bib! Petey was catching several songbirds everyday before I found the Cat Bib for him. He wore the bib all summer long and did not catch any adult birds. He doesn’t mind wearing the bib – in fact, he knows he cannot go outside without it so he waits at the door for me to put it on. I’m happy he’s not able to continue killing the songbirds coming into our yard. Thank you again! Tiger (another rescue — really should be called Gramps) is short legged and slow; however, I think sometimes he waited so long and birds flew right into his mouth?!? For him, I needed to trim the length of the bib because of tripping. He has adjusted nicely — “Who cares — it doesn’t hurt and I get to go outside.” He stands at the cat door to have his bib put on and removed. The rest of the day, he acts like he does not even know it is there as you can see by the pictures — and he has caught NO MORE birds! I am so very, very pleased that our feathered friends are not having to experience such trauma — we want them to LIVE! Shadow, my second rescued cat, is a high-jumper which presents huge challenges keeping him from catching birds and bringing them into the house. Usually, they are still alive and with adrenaline flowing, most of the time I can save them to fly out the front door again. Since using the bib, I have had only one incident. I learned soon (as Shadow is a smaller cat) that the length of the bib needs to be trimmed, but he definitely needs the large size. (With steps to go up and down, the bib shifts and he trips [or pulls the collar completely off] if the bib is not shortened — but that is VERY EASILY done.) I am VERY THANKFUL for these bibs — what a brainstorm!!! Mr. Cool, my oldest rescued cat, was not very excited about having it put on at first, but adapted very quickly and pays no attention to it now. He stands at the cat door while I put it on and also stands inside at night to have it removed. No birds have been brought through my door since donning your ingenious cat bib. I am VERY thankful. This is Deborah, wearing her second cat-bib. She is the family hunter and was bringing birds into the house almost daily before my husband found the ad for your CatBib. She adjusted very quickly to the bib and thinks it’s part of herself. She even washes it! She has only captured one or two birds since last summer when we got her first bib. Thanks for a great and effective little hunter-deterrent. Well, I was skeptical, but I was desperate. Zeke was bringing in an average of 5 victims every week. The breaking point for me came when I found myself having to put a live vivisected bird out of its misery, and then take a ladder into 3 rooms of my home in order to wipe the blood stains off of my ceilings!!! 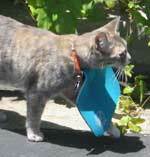 That evening, I turned to the internet and found an article about the CatBib. I’ve been using it on him about 4 months now (since June), and he’s only managed to snag one small lizzard and one bird! That’s it!!! I am very pleased and consider the $10 well worth the cost – even when he occasionally loses his in the bushes somewhere and I have to order him another one. Fantastic solution! Thanks! They keep cats from killing birds. And we love to photograph birds. Hi – Here is Gus with his bib. He is not annoyed with his bib anymore and he has not brought home any birds! I’m not sure how many birds the CatBib has saved. Gus used to get a bird only occasionally (maybe every few weeks), and he hasn’t brought one home since we started using the bib a few months ago. But he also used to bring into the house chipmunks, squirrels, moles, etc. He hasn’t brought any of those into the house since we started using the bib. Yay! He does still catch moles, mice, frogs, and dragonflies, but he doesn’t bring them into the house, and I think the bib has cut down on the number of deaths he causes, which was our goal. The bib is such a great idea! I’m so glad you all thought of it and started making them for other people to buy. We sent Gus’s picture to a friend, and she passed it on to her family and they all bought bibs for their cats. 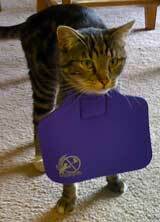 Here El Gato (Grande) is seen sporting his new large purple CatBib in most regal fashion. He has quickly adjusted to the larger size and the birds of our certified Backyard Wildlife Habitat truly appreciate it. Six, perhaps more adept at nailing birds then some of her other feline friends because of her extra front toes and nails, has not been able to solve the mystery in the dramatic decline in her kill rate in the Zuckerman’s backyard sanctuary in the Northern Rockies. 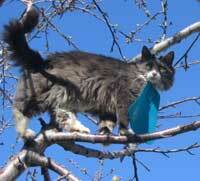 We appreciate as do our feathered friends – thanks CatBib for making a great product even better. The number of birds that all of the neighborhood cats have caught has gone down. The neighborhood kids warn us whenever there’s a cat outside who is “naked” — that is, without their bibs.